William Bruce Pitzer joined the US Navy in 1939. He saw action during the Second World War and the Korean War. He later joined the US Navy Medical Service Corps and was eventually appointed Chief of the Educational Television Division of the Naval Medical School. Promoted to the rank of Lieutenant Commander, he was given a senior position at Bethesda Naval Hospital, Maryland. 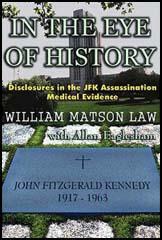 On 22nd November, 1963, an autopsy was carried out by Dr Joseph Humes on the body of John F. Kennedy. A few days after the assassination, a colleague, Dennis D. David, found Pitzer working on a 16-mm film, slides and black and white photos of the Kennedy autopsy. David noted that those materials showed what appeared to be an entry wound in the right frontal area with a corresponding exit wound in the lower rear of the skull. Jerrol F. Custer, an X-ray technician at the hospital, later stated that Pitzer had photographed the proceedings, including the military men who attended the Kennedy autopsy. It was also rumoured that Pitzer had copies of Kennedy's autopsy photographs. According to Dr. Joseph Humes, Pitzer was not present at the autopsy. However, he admitted that the Bethesda Naval Hospital was equipped with closed-circuit television. This was the responsibility of Pitzer and over the years had used these facilities to make instructional movies. It is therefore possible that Pitzer had secretly made a 16-mm movie film of the autopsy on President Kennedys body, without being present in the autopsy room when it was carried out. After 28 years in the US Navy Pitzer decided to retire. He told friends he had been offered a good job working for a network television station. 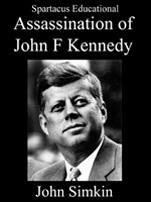 It is believed that he intended to make a programme about the Kennedy assassination. On 29th October 1966, Lieutenant Commander William B. Pitzer was found dead at the Naval Medical School, Bethesda. Investigations by the Naval Investigative Service and the Federal Bureau of Investigation later concluded that a gunshot wound to the head had been self-inflicted. During the weekend on which Pitzer died, the Kennedy family transferred formal possession of the materials relating to the late presidents autopsy to the National Archives. An investigation carried out by Dr. Cyril H. Wecht in 1993 revealed that some items were missing. This included Kennedy's brain that had been stored in a stainless-steel container. FBI files on the investigation, released in 1997 under the Freedom of Information Act, revealed that there was a strong possibility that Pitzer had been murdered. The paraffin tests of Pitzers right palm and back of hand were negative, indicating the absence of nitrate, therefore no exposure to gunpowder. FBI tests indicated "that the revolver must have been held at a distance of more than 3 ft when discharged". Although there were links between Pitzer and the revolver found near the body, the FBI could find no record of Pitzer acquiring live ammunition. The autopsy showed both an entry and exit wound to the head. It also revealed a third wound that was not related to the gunshot to the head. Pitzer had been busy writing notes to people in the time just before he was killed. However, he did not leave a suicide note. One of these notes was found on the floor near Pitzer's body. It bore a partial heel print that was not from the shoes Pitzer was wearing. In May 1995, ex-Special Forces Colonel Daniel Marvin claimed to have been solicited by an agent of the Central Intelligence Agency to "terminate" William Pitzer. An interview with Marvin later appeared in the sixth episode of the television series The Men Who Killed Kennedy (November, 1995). The Pitzers rose a little earlier than usual that fall Saturday morning, 29 October 1966. Bill fixed breakfast while Joyce made preparations in anticipation of a visit from her mother for a few days. Late morning saw them raking leaves in the yard as their 14-year-old son Robert washed the car. When, around noon, a neighbor dropped by to invite the boy to join her in a couple of rounds of golf, Bill finished polishing the automobile. After lunch, he dropped Joyce off at the beauty salon for a 1.00 PM appointment, drove over to the golf course to remind Robert to have a haircut, then stopped in at work to prepare a lecture he was to deliver at Montgomery Junior College the following Wednesday. Joyce missed the 3:07 PM bus, but caught it at 4:07 PM, and was surprised that Bill was not already home when she arrived there. She called his office, and, getting no reply, assumed that he was on his way. As time passed, feeling increasingly uneasy, she called the office again, and again, his club and the hospital emergency room. At 7:20 PM, she called the main switchboard at Bills place of work: the National Naval Medical Center (NNMC), Bethesda, Maryland. The duty officer was alerted. Ensign J.M. Quarles and Security Patrol Officer T.E. Blue opened the locked door to Pitzers television-studio office at 7:50 PM, and found a body on the floor, the head resting in a pool of coagulated blood, a revolver lying close by. Death was pronounced by Medical Officer Lieutenant Commander R.W. Steyn at 8:10 PM, and identification was made by Captain J.H. Stover and Lt. Cdr. J.G. Harmeling; the corpse was that of Lt. Cmdr. William B. Pitzer of the US Navy Medical Service Corps. The Firearms Logbook contained in the Security Office, National Naval Medical Center, Bethesda, Maryland, was examined and in the front of the book was located an undated notation that a .38 caliber revolver, serial number 311546 had been checked out for Lieutenant Commander William B. Pitzer. The signature under this notation was illegible. Fracture, comminuted, supraorbital plate, sphenoid bone, left... After removal of the brain a third defect in the bony skull is encountered. This consists of a large defect in the left supra-orbital plate measuring 3.0 x 1.0 cm. Its the way the game is played, I thought to myself, all the while feeling the beginnings of an adrenaline surge, that shot of extra strength and endurance needed to get me through impossible situations. My mind conjured up wild thoughts about the yet unknown: what sort of intrigue might be in store for the volunteer he was seeking? Only too soon I would learn what I thought at the time to be too much. I now thank God for what I learned in that moment of truth from a CIA Operative searching for a volunteer that would open a door to unlock part of the mystery surrounding the assassination of John F. Kennedy and the untimely demise of those who would open the can of worms that surrounded the conspiracy cover-up. Perhaps a hundred yards into the wooded area behind Group headquarters a slender man of about 510 waited. Dressed casually in short sleeves, light slacks and sunglasses appropriate for the August heat, he flashed his ID, shook my hand and spoke to me in a low and steady voice, asking if I would terminate a man who was preparing to give States secrets to the enemy - a would-be traitor? Not only was I an overzealous patriot at the time, I was trained in assassination techniques and told that I could be asked to volunteer for such a mission outside the United States. Performing that type of mission outside the US was a crucial factor in our understanding. Along with the others undergoing the same type of training, I was led to believe that the resources of the Mafia were to be drawn on by the CIA via an arrangement with them for the fulfillment of Stateside contracts. I was unaware of any rift that had developed between family Dons and the CIA hierarchy. I assumed the hit would be overseas as I was on special orders to report to the 5th Special Forces in South Vietnam some four months hence. Without hesitation I said sure, thinking that once I was in Vietnam I could easily be flown via CIA owned Southern Air Transport to wherever my target happened to be at that time. Once I had accomplished my mission I would return to 5th Group as arranged by the agent in charge, who would be the only one knowing where Id been or what Id done. It was then told to me that it was Lieutenant Commander William Bruce Pitzer whom they wanted taken care of before his retirement at Bethesda Naval Hospital. I refused because it was to be done in the United States. As I left, the agent went on to meet at least one other Green Beret officer that afternoon, perhaps finding a volunteer to do his bidding: LCDR William Bruce Pitzer was found shot dead in his office on 29 October 1966, victim of an assassination conspiracy, shot down in cold blood before he could show the world what he knew about the JFK assassination. Tests by the FBI determined that the revolver must have been held at a distance of more than 3 ft when discharged, otherwise Pitzer would have had powder burns around the fatal wound in his right temple. This raises the question as to whether a 142-grain non-Special slug fired from a distance of say, 4 ft, passing through skull bone twice, would have sufficient kinetic energy to indent a blackboard. After Orders to Kill was published, I received a call from Colonel Dan Marvin, a former Green Beret, who said that when he was at Fort Bragg, he was approached and asked to carry out an assassination of an American citizen (William Pitzer) with sensitive materials in the United States. He refused, saying that he had never signed on for that work inside the US. Marvin said he was a sniper and had no hesitation in plying his trade on foreign soil, but he drew the line when asked to kill Americans in the US. He knows another professional was approached and that the target died of an unexplained not long after. (1) Why else, during the first week of August in 1965, would I have been asked by an agent of the Central Intelligence Agency to kill William Bruce Pitzer, telling me that he was a traitor about to sell States secrets to the enemy? (3) Is it proper to conjecture that whoever killed Pitzer waited patiently until the 29th day of October in 1966 when Pitzer, close to retirement, would retrieve the highly sensitive evidence from its hiding place (perhaps in the false ceiling of his office? ), murder Pitzer and retrieve (perhaps destroy?) that incriminating and indeed irreplaceable photographic evidence? (4) Why was the weapon that killed Pitzer assumed to have been in his possession when there was no proof that he had, in fact, ever signed for the weapon on that day? The FBI investigation states that an undated notation that a .38 caliber revolver, serial number 311546 had been checked out for Lieutenant Commander William Bruce Pitzer. The signature under this notation was illegible, (emphasis mine). I dont know about others who read this who had experience in the military - but during my 21 years in Uncle Sams Army I never knew nor heard of a weapon, particularly a sidearm, being taken from an arms room (or security office) without the individual himself signing for that weapon on a specific dated entry. (5) Why are there two death certificates for one death? 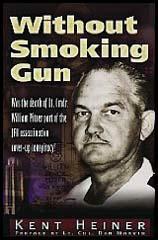 (6) Why did the FBI investigation tell of one being prepared by Deputy Medical Examiner John G. Ball of the State of Maryland, who, according to the FBI report, told the Navys Investigative Service that he (John G. Ball) had observed muzzle marks around the wound and powder burns when Pitzers autopsy findings showed no powder burns or muzzle marks? (7) Why was the US Navys Death Certificate on Pitzer dated 1 Feb 67 when he was killed on 29 Oct 66? (8) Why, when the 143 page documentation (including undated cover letter of three pages) of the FBI investigation into the death of William Bruce Pitzer provided by the FBI and received by me on 2 August 1997, included multiple examples of US Navy requests made to FBI Director J. Edgar Hoover for examination of certain items forwarded by the US Navy to the FBI, specifically A .38 caliber Smith & Wesson (S&W) revolver, military issue, serial #311546 found near body as noted in the Naval Investigative Service Office Washingtons 1 November 1966 letter to J. Edgar Hoover (File # 20- BE/DEA/js Ser: 1956, is it a fact that the complete report contains no reference to the finding of or the lack of fingerprints or the lack thereof on this pistol? The answer to the aforementioned question is extremely important inasmuch as the investigative report tells of Pitzer committing suicide by a right-handed self-inflicted handgun wound in the head and yet Pitzers associate whom he had shared the fact and the essence of his secret possession of the autopsy photos, Dennis D. David, told me unequivocally, when I first spoke with him, that his friend William Bruce Pitzer was indeed left handed. (9) Why was the widow Pitzer refused a copy of her husbands autopsy for 25 years after his death? (12) Last, but not the least question to this date: Why has there not been a reinvestigation into the death of William Bruce Pitzer when so much evidence relevant to and supporting an assassination has been made public by this author and others, including a courageous, now retired, career Navy man, Dennis D. David. Dennis told me during a visit to Ithaca, New York, where I lived at the time (and he has gone public with what he recalled) that he had personally seen the film, pictures and slides of the JFK autopsy with Bill Pitzer in Bills office in the Audio Visual Department of the Navys Medical School at Bethesda, Maryland in 1963. Law: Who was William Pitzer? Custer: At that time he was the chief in charge of the photographic department of the National Naval Medical Center. He and Dennis David were buddies, long term friends. Dennis wasn't on duty that night, but Chief Pitzer' was. I remember seeing him that evening and he was all around. I mean everywhere you went, you saw Chief Pitzer. He was there. And it's funny to the fact that the man-he never noticed what was around him. He kind of turned the commotion off and he was doing his job. That's what he was paid to do. Law: What was he doing exactly? Law: He was taking movie film of the autopsy? Law: And you saw this? Custer: I saw this. Later on it was brought out that Commander Pitzer - well of course he made commander farther down the line - had committed suicide by blowing his brains out by putting a gun in his right hand and shooting himself. Law: What's so unusual about that if you're going to commit suicide? Custer: Well, it's kind of funny. How can you commit suicide when you have a deformed right hand? That couldn't hold a gun? This was clue to a birth defect. And Dennis David' knew it. Everybody that knew the chief knew it and it was evident that night. When he was taking the movies, you could see the hand was deformed. But suicide was the reason for the death on his death certificate, which, I felt, was part of the cover-up. See, you have to be there. You have to see what's going on. Everything is plain and simple. It's there! It's right in front of you! The government feels the experts, so-called experts, are going to look at everything but the nose on their faces. And if you just stop and look at what's right in front of you and not try and surmise, "Well this is why, this is why that happened." My God-Kennedy's skull was pushed backward! Basic physics! You had to have a force from the front! If you had a force from the back, everything would have been pushed forward. Common sense! Doesn't take a genius to figure that one out. Law: What happened to Bill Pitzer? David: As l said, Bill was one of my mentors - and I took the program for MSC in '64 then - starting early '64 - and missed it. They selected forty - I was forty third on the list. In 1965 I applied for and took the program again. And there were sixty selected that year, and I was number two on the selection list. So then, in late August of '65, Congress passed the bill and the president signed the bill, and I became an officer and a gentleman (laughter). I used to laugh about that because I used to say, "Well, they made me an officer, but my mother made me a gentlemen." At least I tried to be, before that. I left Bethesda in the first week in December of '65 to go to Officer's School and Naval Justice School in Newport, Rhode Island, And shortly before I left, Bill indicated to me that he was getting ready to retire - probably in '66 - and he would have had, I think, thirty years at that time. He had been through the second world war for one thing. So I left, and reported in at Newport, Rhode Island, in the early part of January. I went through the three weeks at Officer's Training School and Naval justice School, and was assigned to a naval hospital in Great Lakes - one of the jobs I had there was as an assistant to one of the department heads. I was in the lobby of the hospital at Great Lakes when Lieutenant Commander Barb Munroe came in and saw me and came over, and of course we renewed old friendships. And she said, "By the way, did you know Bill's dead?" And I said, "No, what happened?" Then she said, "Well, he shot himself." I said, "I don't believe that." And she said, "Well they found him with a gun in his right hand, and he blew his brains out." And I said, "But Bill's left-handed..." That's what I recall, because sometimes - back at Bethesda, Barb, Bill, and I would play bridge together - he sometimes would deal the cards in reverse, you know instead of dealing them clockwise he would deal them counter clockwise (with his left hand) and we'd kid him about it. That was the first time I had heard he was dead. I asked, "Well, why did he commit suicide?" And she said "It's highly questionable that he did." I said, "Well, it stands to reason." And then she said something to me about, "Did you know that he'd had some pretty good job offers?" And I said I had, and that just before the last time I'd seen him, just before I'd left Bethesda, he'd told me that lie had some very lucrative offers from a couple of the national networks like ABC, CBS, to go to work for them. I said, "I suspect it was probably because of some of the films and the material he had from the assassination." She said, "You know he had those?" And I said, "Yes, because l was over there a couple, three days after the autopsy and saw them." She kind of nodded her head as though she agreed with me, or something like that. Law: Did she apparently know that he had the film? David: I don't know whether she did. She seemed surprised when I told her that I knew about it though. Now whatever that was -the reaction - that was the first time she heard... we really didn't discuss it too much after that, because even in '67 - excuse me, in '66 May or June - you still didn't talk about what you knew, your experiences on the night of the assassination. It was still classified information. Law: It's not so unusual that somebody would commit suicide. It happens every day. Why do you feel that Bill Pitzer would not have done this? David: Because I knew the man. You can say well, lie wasn't the type to commit suicide. Well, what type will commit suicide? I don't know, it was just a gut feeling. I didn't think that he would do it. He had been through too many stressful situations in his life. Second world war-he had been in and out of Vietnam for various and sundry reasons-dealing with classified information and I didn't think-you know, lie was not a weak personality type, or type of person who would ever run into anything he couldn't handle, whether it be stressful or whatever, mental. I knew lie had some problems with his kids, but lie generally had a "well you know it will work itself out" attitude towards that. So I don't know. I just didn't feel like lie was the kind of man who would commit suicide.